Thanksgiving is a time to reflect and think about all the amazing opportunities and qualities in your life you are grateful for and appreciate. A time spent with family, Thanksgiving reminds everyone to say what they are thankful for and to thank others for positively impacting their life. To celebrate this holiday, here are a few reasons campers are thankful for Camp Starlight. 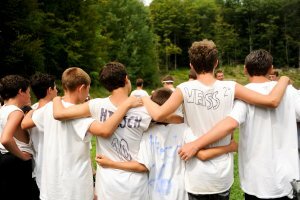 The Friendships: Camp Starlight is an environment that helps friendships that last longer than the summer bloom for campers. Camp friends are people you can truly rely on and think back fondly on. Camp friends are always there for you no matter what time of year which we are truly thankful for. The Fun: The campers are consistently thankful for the crazy fun they get to experience all summer long. From Evening Activities, to Krispy Kreme S-Days, and cheering for blue or white during Olympics, the campers really get to bond during special events. Campers are thankful for the memories these event creates. The Beauty: The lake at Camp Starlight hosts a myriad of activities and provides campers with a simultaneously exciting and relaxing space. The sunsets every evening at the lake are breathtaking and reminds campers how Starlight’s scenery is beautiful. The Memories: Thankful for all the amazing memories created summer after summer. From laughing hysterically with bunkmates, making a new friend, the opportunity to be the main character of the musical or nail a bulls eye in archery, campers are grateful for all the special memories each summer. This entry was posted on Tuesday, November 20th, 2018 at 8:02 am	and is filed under Summer 2018. You can follow any responses to this entry through the RSS 2.0 feed. You can leave a response, or trackback from your own site.